NASA encourages the investment in our nation’s young minds through a myriad of education programs. The agency has traditionally played a key role in preparing, inspiring, exciting, educating and nurturing the young minds of today, who will be the workforce of tomorrow. 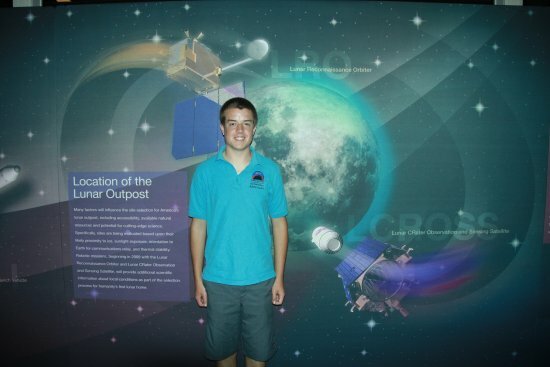 Two students involved with the Goldstone Apple Valley Radio Telescope program (GAVRT) program were on hand to observe the June 18 launch of LRO/LCROSS. The GAVRT program enables students to operate and control a 110-foot, 500-ton deep space radio telescope located at NASA’s Deep Space Communication Complex at Goldstone, California. This program is a partnership between NASA and the Jet Propulsion Laboratory (JPL), along with the Lewis Center for Educational Research. The program allows students to actually take control of the massive satellite dish via the Internet to study a variety of radio sources in space. Students collect and analyze data that goes into a database used by professional scientists worldwide. Much of the student data are published in professional journals, which demonstrates to students the importance of their data and contributes to the “team building” goals of the GAVRT program. 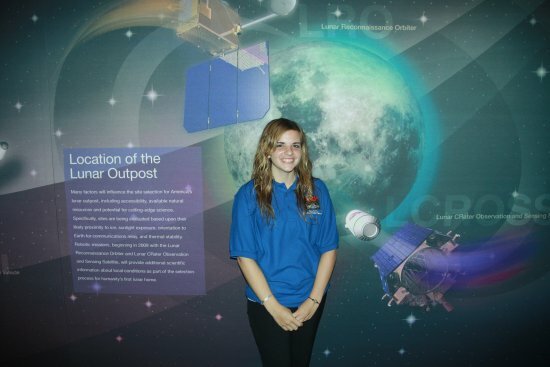 The Purpose of the GAVRT program is to provide students and educators with curriculum vehicles that will promote science literacy, support a better understanding of the scientific community, and to provide the opportunity to collect real-time data with sophisticated science equipment through distance learning. Alicia and Chase share their experiences in the posts below. A once in a lifetime experience along with simple and joyous laughter is the perfect memory. These memories will last a lifetime. I have to say that these memories mean more to me than any before. I honestly feel that most people never reach the sincere state of gratitude and appreciation for life that I have found from this trip. I am known to be a very very very friendly human being, but even I cannot find the words to come close to showing what these days and these people mean to me. Today was the LCROSS Launch!!!! The weather began to change and people were talking about changing the date. People would be the happiest of their life at one point and then a few minutes later, be filled with sadness. So many people came together for this launch and there was unbelievable desire for success. I wanted the LRO/ LCROSS to launch not only for me to see, but for those who had put all their passion, conviction, and drive into making this mission a great achievement. When the rocket launched, I had a wave of utter bliss and joy run through me. I have to say seeing Brian Day glow was a definite highlight! I loved seeing other members of the LCROSS Team crying with happiness. All around I will cherish that moment for as long as I live. It was so great to see the flames, the smoke, and ohhh man the noise was unlike anything I have ever heard. There was a great and powerful rumble throughout the sky. It was an awesome sight to see! I can say that this trip has changed my life. The GAVRT Program has changed my life and has provided me with the chance to see my very greatest potential. I have not only gained a profound love for science, but I have learned to believe in myself. We need to come to the realization that now is our time to shine. The GAVRT Program gives anyone the chance to be a hero. You! Yep, you can be involved! You can help NASA’s return to the moon. From children to grandparents, anyone can participate. My heart is filled with excitement for this Mission. The partnership of GAVRT and NASA is just beginning. The future has no boundaries and the present is ready for you to be an explorer, be an inspiration, and most of all make a difference in this world. It is so easy. I have been blessed to be a part of such a wonderful organization and I would love to see many more students with the incredible opportunities I have been given. I have taken so much from these experiences. I have learned the importance of trust, ambition, confidence, and most of all hope. I have learned that one human being can have an outstanding impact on this world. But more importantly that a group unified and filled with trust and humility can make any dreams come true. I am ready to make an imprint in the world of science, ready to discover, and most of all…ready to inspire people just the way that these wonderful people have inspired me. Thank you to all for your kindness and most of all for having faith in me. When I look back on this Florida journey years from now, I will have many memories. Of all the great memories I have had here, today was definitely the highlight. Today served as the culmination of many astronauts, scientists, and engineers work for the past five years. With all of the excitement that occurred to today, it is ironic how the launch was just minutes away from possibly being scrubbed. Thank goodness it wasn’t. The day started out well as we returned to Cape Canaveral. Our first stop was the Astronaut Hall of Fame. Although we only had a few minutes to spend at the Hall of Fame, we saw a lot while we were there. We got to see a lot of different equipment and displays from the Apollo missions. After our time at the HOF concluded, we headed back to Kennedy Space Center. At KSC, we saw our second 3D IMAX film in the last two days. This film talked about the different tasks that have been completed over the years at the International Space Station. 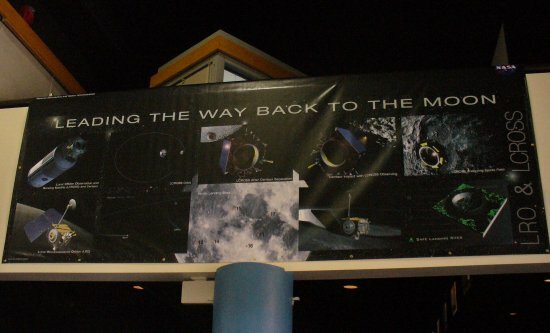 After the film, we began to prepare to board the bus to head out to the launch viewing area. After about an hour, we went out to the point where we would view the Atlas V rocket launch. Unfortunately, about thirty minutes prior to the first launch time slot, it appeared as if the LCROSS launch would be delayed yet again until Friday. Although some might not understand why one day would make that much of a difference, it would be quite disheartening for our GAVRT (Goldstone Apple Valley Radio Telescope) if the launch was delayed because we are heading home tomorrow. The reason for the concern was due to potential thunderstorms in the area. To our delight, we soon found out that it would indeed be safe for the rocket to launch. One of the best memories of the day occurred about five minutes before the launch. Our fine country’s national anthem, the Star Spangled Banner, was triumphantly played over the speakers. As I listened to the anthem, it was amazing to feel how much patriotism was in the air. As I heard the words I thought about all of the astronauts who had risked their lives in hopes of improving space exploration. It is because of great men and women like the Apollo 1 and Challenger crews, who gave their lives for their country in the name of astronomy. Without their efforts, it is unlikely that America would be in the position that it is today; on the verge of returning to the moon. The launch finally arrived and it was nothing short of spectacular. The countdown felt like an eternity as we thought about what was to come in the future plans of NASA. As the rocket ascended above the clouds, we all knew that a new era of lunar exploration had arrived, and it was vibrantly illustrated far above us. I will never forget the extraordinary memories I have had on this trip. I am anxiously looking forward to tracking LCROSS as it grows closer to its’ lunar impact. It almost didn’t happen. Over 2,000 miles, lost luggage, little sleep, approaching storm; but at about 5:20pm EDT today, we heard the words, “We are green for launch!” Cheers erupted amongst the bleachers that held hundreds of people. It was an incredible event (and very difficult to take photos as all I wanted to do was stare!). It seemed to move in slow motion at first but soon disappeared in the ubiquitous clouds. I felt very blessed to witness the event in person (in fact, I highly recommend it if you ever get the chance!). One of the most memorable things I noticed was the team or family atmosphere that surrounded Kennedy Space Center. Individuals from all over the United States worked on either LRO or LCROSS, yet the respect they had for each other was profound. There were so many different teams coming together as one. It felt like attending a family reunion. Their emotions were evident on their faces and all were choked to see the spacecraft finally lift off. Thank you to everyone at NASA Ames Research Center, especially Brian Day, for inviting GAVRT to be a part of your program and for allowing me take part in this exciting event. Good luck, God Bless, and God speed!